One of the fastest movers in the Blue Jays minor league system is that of right-handed pitcher Justin Maese. 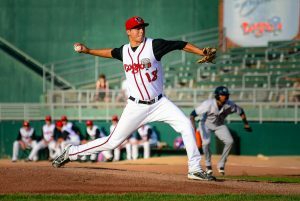 Jumping levels quickly due to the command he has of all four of his pitches has really helped the 19-year old prospect reach the low-A Lansing Lugnuts in just one year removed from high school. Finding success with his 4-seam fastball, 2-seam fastball, slider, and changeup hasn’t been an issue in 2016. Currently maintaining a 1.08 WHIP and a 5.63 SO/W ratio in his 66 innings pitched between Vancouver and Lansing; shows that the up-and-coming star is on the right path with his career. Known primarily for his sinking fastball. There’s no question why Maese’s K/9 ratio is currently at 6.1 as he likes to pitch to contact for quick outs instead of chasing strikeouts. Explaining how he uses his sinker to his advantage when facing opposing hitters, Maese admits it depends on the situation on whether or not he’ll show his 2-seamer that usually sits in the 91 to 93 miles per hour range. When his sinker is clicking he can easily mix in his slider to give the batter something totally different to think about. Currently throwing the slider around 89; Maese is happy with the feel for this pitch right now, as he believes it has improved leaps and bounds since high school. But the greatest thing about Maese’s game is the differential between his 4-seam fastball and his changeup. Usually sitting at a 10 mile per hour difference between the two has really helped the prospect keep hitters off-balance all season. This skill has really impressed Lansing Lugnuts pitching coach Jeff Ware who feels Maese will find a lot of success on the mound if he can continue to maintain his arm speed when throwing these two pitches. Making the jump to professional baseball last summer; Maese discusses the differences from playing high school baseball in Texas to pitching in the Gulf Coast League in 2015. Taking advantage of great coaching is second nature for Maese who’s been blessed to have his Dad as his coach up through middle school. While he had to focus on the game without his father’s guidance in high school, the prospect feels it was the fundamentals he learned growing up from his Dad that got him to where he is today. With the conclusion of the season fast approaching, Maese has only one focus for the remainder of his year in Lansing. If Maese continues to keep this mindset moving forward his stock will only rise in the upcoming seasons. Currently ranked the 11th best prospect in the Blue Jays organization by MLB.com, fans shouldn’t be surprised to see the young Texan jump into the top-10 in the near future. But if Justin Maese continues to stay humble and take in as much coaching as possible success in the majors won’t be far away no matter where he’s ranked. Best wishes to Justin he seems to have started the climb by doing the right things.